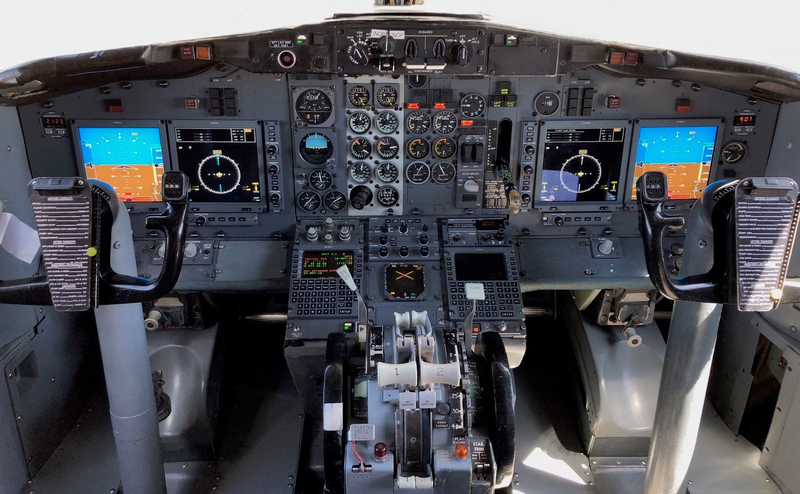 Long Beach, CA - September 25, 2018 – Universal Avionics (UA) announces that 10 Nolinor Aviation Boeing 737-200 aircraft are undergoing a modernization program for state-of-the-art avionics and glass displays. The aircraft upgrade includes 4 UA EFI-890R Advanced Flight Displays and the addition of a second UA UNS-1Lw Satellite-Based Augmentation System (SBAS)-Flight Management System (FMS). The first upgrade is complete and the aircraft has re-entered service, and the second aircraft installation is in process with UA Authorized Dealer, Mid-Canada Mod Center. The upgrade addresses equipment obsolescence and increasing difficulty in supporting older electromechanical instruments, greatly improving reliability and safety. The EFI-890R Advanced Flight Displays also allow Nolinor to focus on increasing dispatch reliability and mission completion – meeting the needs of mining companies, and transporting more than a hundred passengers to extremely remote villages only accessible by air. "We have been highly satisfied with the recent installation of the EFI-890R and UNS-1Lw SBAS-FMS in our B737-200," said Yves Bergeron, Director of Operations for Nolinor Aviation. "With seamless integration in our cockpit, we've benefited from increased accuracy in our flight operations as well as enhanced situational awareness for our pilots," he added. "We are now benefiting from this system's reliability, which greatly reduces aircraft downtime." An SBAS-capable FMS has become a must for commercial aircraft operating in Canada's north where weather can be challenging and the ability to fly RNAV (GNSS) LPV LOS approach procedures are often necessary to complete flight operations. The UA UNS-1Lw SBAS-FMS's combination of analog and digital inputs/outputs makes it an ideal fit for the B737-200 aircraft. In addition, gravel runways included in the FMS Navigation Database, as well as True North course approaches, and FMS Temperature Compensation (TEMP COMP) were all sought-after features offered with the UA SBAS-FMS. "We're very fortunate at Universal Avionics to be playing a part in Nolinor's relentless focus on providing their clients with the safest, most reliable air transport possible," said Norm Matheis, Universal Avionics Canada Senior Regional Sales Manager. "The B737-200 is the main heavy lift transport for Canada's north with its gravel and ice runway capability and this is a stunning transformation of the flight deck by MC2, that future-proofs flight operations," he added. "We have a unique track record when bringing new technology to older cockpits," said Bill Arsenault, Vice President of MC2. "MC2 have become champions in the process of extending the life of classic aircraft like these," he added. "Improved efficiency and operational flexibility – especially in aircraft working the North in such varied operational situations – have become industry trendsetters for MC2. The opportunity to once again help out an operator in this manner brings us pride and satisfaction regarding the advanced level of avionics support and engineering we offer all our clients." With only 77 Boeing 737-200 aircraft remaining in service today, Nolinor Aviation's fleet is the largest in the world. To learn more, visit UA Booth #229 during the 2018 RAA Annual Convention.